Ever since the outbreak of open warfare in Europe in 1939, the United States had been embroiled in a debate as to how to respond, with the general preference being for isolation and remaining aloof. Despite the administration’s ill-disguised sympathy for the British cause, most Americans were much more concerned about Japan, yet relatively little had been done to prepare should war break out, partly because many underestimated the abilities of Japan to threaten the industrial might of the US. The shock that followed the Japanese attack on Pearl Harbor and other American Pacific possessions in December 1941 provoked a fierce determination to strike back, but in the early months of the war the US suffered many defeats as her small army struggled to hold on. Eventually of course there was only ever going to be one winner, but this set depicts the US troops during those first few difficult months, when the balance of forces was much more even. We have already reviewed the first Strelets set on this subject, Set 1, but there seems no different theme to this second set. The quality and style of the sculpting looks exactly the same, with a fairly good standard in Strelets terms. Detail is fair and proportions not too bad either, but where the detail needs to be particularly clear, such as weapons and webbing, this set is well short of the best available elsewhere. Some thin elements such as bayonet scabbards are still thicker than they should be, but the general impression is not unpleasing. On our samples we found almost no flash, and the choice of poses means there is no unwanted plastic anywhere either. Those poses, naturally done to allow manufacture with a simple two-piece mould, have a small element of flatness, but nothing particularly noticeable. They do not differ markedly from those in the first set, delivering unremarkable but useful figures mostly firing their weapons or moving forward. Perhaps the pick of the crop are the first two in the third row, but it is good to see the advancing men actually leaning forward as if in some hurry. As for the uniform, well this set exactly echoes the characteristics of the first. The men all wear summer/tropical dress (known as 'khakis' or 'chinos'), being a shirt and trousers plus boots and leggings. The shirts have two breast pockets, which is correct, but many also clearly have shoulder straps, which was a feature for officers only, so while the occasional grunt may have such an item, they are far too common in this set. In addition, though hard to be sure, some of the trousers seem to have a large cargo pocket on the front left thigh, rather like the British battle dress, but this is incorrect on these men. As with the first set, the leggings here are really much shorter than they should be, and while boots with anklets and short gaiters appeared later in the war, we felt everyone here should have standard leggings that reached well toward the knee. All the soldiers wear the brimmed M1917 steel helmet of British design, which is good as the new M1 helmet only started appearing in numbers in 1942. Once again the officer has been given his ordinary campaign hat to wear, which marks him out as an officer for our benefit but was not actually worn in combat, not least precisely because it helped highlight officers to the enemy. This man also wears a service coat - again more to distinguish him than anything else - though he does at least have the proper leggings. Like much of the equipment and uniform, the webbing dates back to the Great War, and so should be the M1910 type with 1928 modifications. Many of the poses hold their weapon in such a way as to obscure their pouches, but we were happy with the pouches on most. The second man in the top row has two tall pouches on the waist, again very much in the British style, but we could find no evidence of this amongst GIs so must also mark that as a strange mistake. Most have a water bottle of proper design, and a bayonet or knife. Four also wear a pack, but none are the usual M1910 pattern actually used at the time. Though not identical, they are all fairly square with a small flap, and look a lot like the M1936 field bag ('musette bag'), which could indeed be worn on the back like this. However it should be noted that such an item was generally only issued to officers, armoured and motorised infantry and paratroops, so while the ordinary US rifleman would use one if he could get hold of one, their frequency here greatly exaggerates their likely occurrence in real life. No discussion of World War II soldiers would be complete without reference to the weapons being carried. 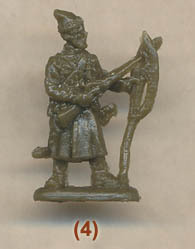 Several of course carry ordinary rifles, which could be the M1 Garand or the 1903 Springfield - detail is not good enough to be sure of which on these figures, though the sniper with the scope in the second row is almost certainly using a Springfield. Three of the poses are carrying the much-loved Thompson submachine gun, all of the same model with the horizontal fore-end and the standard military box magazine. Design is good, but like the first set all those here are about 15mm in length, which is 108cm and so a lot longer than the real thing, which was more like 85cm long. Thompsons were usually carried by squad leaders and junior officers, so a bit of a surprise to find so many here. The first figure in the top row is interesting as he seems to hold a shotgun, which is not an unreasonable weapon in this context so good to see. The man below him is holding a BAR, and the water-cooled .30 calibre Browning M1917A1 machine gun in the third row completes the weapon line-up apart from the pistols in the hand of the officer and holstered on the gunner. While detail is vague and the Thompsons are too large, the only other weapons problem is with the tripod under the Browning, which is very oddly arranged in order to allow it to be moulded as a single piece. We liked the way many of the men have their sleeves rolled up, and the business-like poses are fine too, although the Browning gunner is unusual in that he has his left hand on the trigger and his right seems to be adjusting the mount. A little more kit might have been good, since no one here has the small first aid pouches usually seen, and also no one has two water canteens, another fairly common sight. The various little inaccuracies do add up, unfortunately, but this is a workmanlike set that matches well with the first set, covering a period that had previously been little recognised in the hobby.